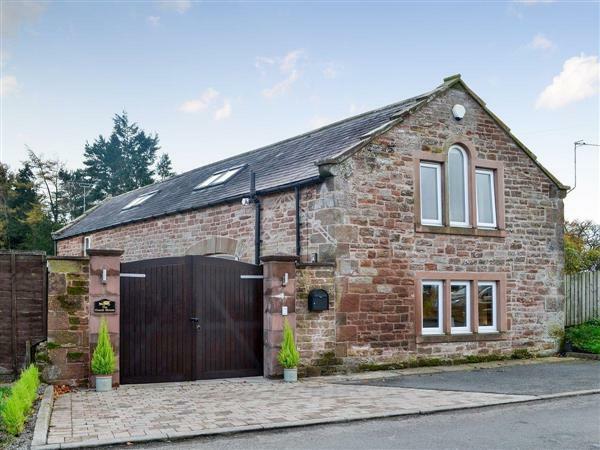 The Coach House in Brampton, Cumbria sleeps 4 people. The Coach House in Brampton is a superbly equipped barn conversion situated on the edge of this delightful market town. The Coach House is a quirky semi-detached property which has an upside down layout with the spacious living/kitchen/dining area on the first floor. Everything has been thought of to ensure you have a relaxing stay, from the sumptuous beds and luxurious toiletries to the cosy gas fire and large TV in the sitting room, home from home in every sense of the word. Take a stroll into the centre of town and sample the many good restaurants and pubs. A must is a trip to Talkin Tarn Country Park, 2 miles from Brampton with its 65-acre lake set amidst 120 acres of farmland and woodland. The Tarn is an ideal place for recreation or a quiet stroll through the mature woodlands. No stay in Cumbria is complete without visiting Hadrian’s Wall, the most important monument built by the Romans in Britain. It stretches 73 miles from Wallsend, Newcastle across the neck of England to the Solway in north west Cumbria. Within Cumbria are Banks Turret, near Brampton and Birdoswald Roman Fort a few miles away. The Coach House is also an ideal base to explore Carlisle, The Lake District, Northumbria and the Scottish Borders. The shop, pub and restaurant are 800 yards from The Coach House in Brampton. Bedroom 1: With super king-size bed (can be twin beds on request), Freeview TV and en-suite with double ended bath, shower cubicle, toilet and heated towel rail (also accessed from hall). Bedroom 2: With king-size bed, Freeview TV, dressing room and en-suite with walk-in shower, toilet and heated towel rail. Bathroom: With double ended bath, shower cubicle, toilet and heated towel rail. Living area: With gas log-effect stove, Freeview TV (with Sky sports mix and Sky Q) and DVD player with a selection of DVDs. Kitchen area: With gas range with 6-ring hob and oven, fridge, freezer, dishwasher, Nescafe Dolce gusto coffee machine and washer/dryer. Gas central heating, gas, electricity, bed linen, towels and Wi-Fi included. Travel cot, highchair and 2 stairgates available on request. Welcome pack. Selection of board games. Enclosed courtyard with garden furniture. Private parking for 2 cars. No smoking. Holidays at The Coach House run from Friday to Friday. Pets allowed at The Coach House. For a better idea of where The Coach House is, you can see The Coach House on the map below. The Coach House is in Cumbria; should you be on the lookout for a special offer, you can find all the special offers in Cumbria. It's always worth checking to see what is on offer at the moment. Do you want to holiday near The Coach House (UKC2537), you can see other cottages within 25 miles of The Coach House; have a look to find your perfect holiday location.